If you are a group of three or more mates, colleagues, a family, just guys who would like to challenge yourselves and achieving something inspiring for yourselves and your families. Contact Didier 0410 756 065 for this hike in your time. 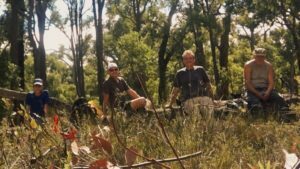 Hi, I’m Didier and I invite Australia’s FIFO men on this 4-day hike on Western Australia’s world famous Bibbulmun Track. FIFO men and their families are under enormous pressure. This small group hike has been designed to challenge and discover something incredible within guys. A time to walk and chat, share stories within a group of your peers. A time to reflect on how we fit into work, family, and society. A few days in nature brings out the best in someone. My first vision of Didier Walks came to me during my 2016 solo end-to-end of the 1000km Bibbulmun Track. I didn’t fit the long distance hike mould; I was overweight, very unfit and didn’t participate in any outdoor physical activity. But the Bibb called me and I’m so glad I replied with a “yes”. The four-day journey takes place on a 66km section of Western Australia’s world famous long distance Bibbulmun Track. We will all meet early at the Cockburn Central Train Station, Knock St, Jandakot. Where transport will pick us up and take us to the Three Way Roadhouse/Tavern on the Albany Hwy, North Bannister. Our hike begins by heading 15km south over the stunning 360-degree views from Boonering Hill onto White Horse Hills Campsite. This day is known for its rock formations. A 16km hike mostly flat and ending with a climb up to Mt Wells where we will find the former fire lookout & cabin which is now a campsite with the only 4 wall hut on the track. 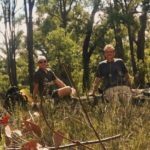 Day three is 15km, it takes us back down Mt Wells and walks us through some of the most beautiful forests on the track. This ever-changing forest scenery and easy going section take us onto the very tranquil Chadoora Campsite (see the main photo). This is a days hike means so much to me, its 19km into Dwellingup the location where I completed most of my training and my first overnight hike. The final 9km we follow the Hotham Valley Railway into town. Don’t allow a lack of fitness or confidence stop you. I will be there to help you prepare for the hike both physically and mentally. If you have any concerns I recommend that you speak to your health professional. From my professional experience, I am also able to speak to your support network. 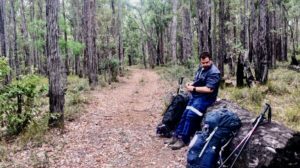 This is Sol, a FIFO Head Engineer who started with a group day hike and since then has hiked over 125km and completed this 4-day hike with me. His authenticity, willingness to change and watching his transition has been inspiring. I bring 15 years of mentoring, almost 2000 km of hiking experience. I observed how hiking changed my life, the life of others and of my clients since Didier Walks first steps. A $100 deposit is required to confirm your place. The full amount must be paid 30 days prior to the hike start date. In order to cover costs, I require a minimum of 3 fully paid bookings for the hike to run.